Morris dancing is a traditional English folk dance that has existed since medieval times. Morris dancers can be found in London where the seat of English folk dancing is based at Cecil Sharp House. However, the tradition most strongly continues in rural districts, festivals and the north and midlands areas of England. Nottinghamshire, Derbyshire and other regions near the peak district offer an enthusiastic dance tradition set against the backdrop of country villages and beautiful misty peaks. Records conflict about the origins and meaning of Morris dance, but the modern rendition basically consists of a combination of step-dancing, circle-dancing and choreographed sword-fighting using sticks.The dance is usually performed by young men dressed in simple attire adorned with jingle bells, flowers, ribbons or other festive materials. The dance is accompanied by musicians playing traditional music with recorders, accordions and drums. Other aspects of the dance include a dancing horse and jugs of ale. These parts of the dance, along with the symbolism of flowers, bells and ribbons, are thought to originate in medieval celebrations of spring and the revival of life after winter. The dance itself usually occurs in an open space where lots of visitors can gather to watch, such as outside a local cathedral or on high streets. 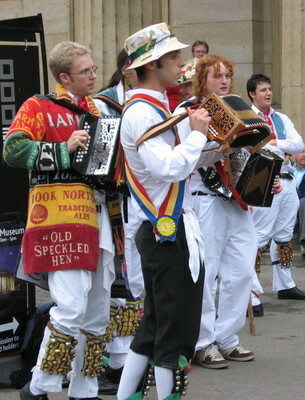 Morris dancing is performed throughout the year, but the most popular time is during the spring and summer months, particularly in celebration of May Day. Nottinghamshire and Derbyshire are about 2 to 3 hours away from London and can be visited in a day. The more northern peaks into Yorkshire are best visited as a weekend excursion. Morris dancing is organised by local troupes and it is best to visit the homepage of the area you're visiting to check performance schedules. A list of Midlands-based troupes and links to their homepages is available. Also, a website run by the Freaks in the Peaks Morris dancers provides updated information about events and performances. Why? Experience a lively English tradition in the rural Peak District. When: All year round. Particularly during May.